Migrants from Honduras, part of a caravan of thousands from Central America trying to reach the United States, jump onto a border fence to cross illegally from Mexico to the U.S., in Tijuana, Mexico, Dec. 12, 2018. U.S. President Donald Trump and Mexican President Andres Manuel Lopez Obrador tackled the issue of immigration in a phone call Wednesday. The White House said the two leaders "discussed the need to address illegal migration from Central America to the United States by addressing the drivers of migration, such as insecurity and economic stagnation." Lopez Obrador says he and Trump discussed migration and the possibility of working together on a program aimed at boosting development and job creation in Central America. Mexico's new President Andres Manuel Lopez Obrador holds a news conference at National Palace in Mexico City, Dec. 3, 2018. López Obrador described called the conversation "respectful and friendly," in a Tweet late Wednesday. 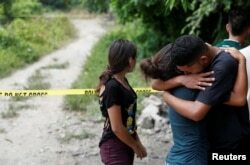 The Mexican leader has proposed a roughly $30 billion plan over five years to create jobs and address poverty in Central America in hopes of resolving the underlying causes that currently have migrants traveling into Mexico in hopes of a better life there or in the United States. López Obrador, who took office December 1, wants the United States and Canada to join in the effort. Earlier this month, in an interview with VOA's Spanish service, U.S. Secretary of State Mike Pompeo said he had discussions with the new Mexican administration about creating opportunities for people in Guatemala, Honduras and El Salvador "so these people will have better lives there." "It’s the capacity to live their lives the way they want to with economic success and freedom," Pompeo said. "We’re committed to assisting in that, and in the time that we can’t get there, we’re also determined to make sure the human rights of the migrants are respected. At the same time, enforcing U.S. law." 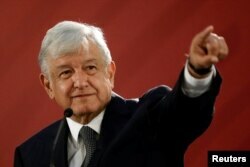 López Obrador said at a news conference Tuesday that such talks with the United States are progressing. Trump and members of his administration have taken a hardline stance toward the Central American migrants escaping poverty and violence, telling his supporters at a rally that the migrants should turn around and go home because they will not be allowed into the United States. He also deployed thousands of troops to the U.S.-Mexico border and is now threatening a government shutdown if Congress does not approve funding for his desired border wall. 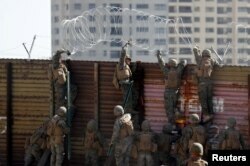 U.S. Marines install concertina wire along the top of the primary border wall at the port of entry next to Tijuana in San Ysidro, San Diego, California, Nov. 9, 2018. Guatemala, Honduras and El Salvador have all agreed to work on Mexico's plan to address the underlying causes of migration. They stressed the need to approach it as a complex, regional problem that requires efforts to facilitate safe and orderly migration with respect and protection for human rights. Representatives from the four countries discussed the plan at a U.N. migration conference Monday in Morocco. Honduran Foreign Minister María Dolores Agüero said the effort prioritizes respect for the dignity of migrants in line with international rights and with special emphasis on the welfare of children and the protection of human rights, independent of immigration status. Mexico Foreign Secretary Marcelo Ebrard said the countries want to compete with the narrative that has taken hold in much of the world, including in the Americas, that the best way to confront migration is exclusion and control. Migrants, part of a caravan of thousands traveling from Central America en route to the United States, make their way to Tijuana from Mexicali, Mexico, Nov. 20, 2018. About 7,000 migrants have arrived in the Mexican border city of Tijuana, straining the capacity of an area that was already hosting thousands of people hoping to gain asylum in the United States. Those pursuing that option will have a long wait, with the main U.S. border entry port in the area said to be processing as many as 100 asylum seekers per day, and often many fewer. A demonstrator, part of a protest march against migrants, shouts towards a line of police in riot gear who were standing guard over a temporary shelter housing a caravan from Central America, in Tijuana, Mexico, Nov. 18, 2018. Interior Secretary Olga Sánchez Cordero said Wednesday the new administration had resolved the crisis in Tijuana by installing health centers, food service and children's activities to help those staying in the shelters and camps. She also said López Obrador has proposed a program called Christmas at Home (#NavidadEnTuCasa) that would grant transportation assistance and accelerate voluntary repatriation for those migrants who choose to go back to their home country. White House correspondent Steve Herman contributed to this story.